Work from Kopienkritik at Skulpturhalle Basel. 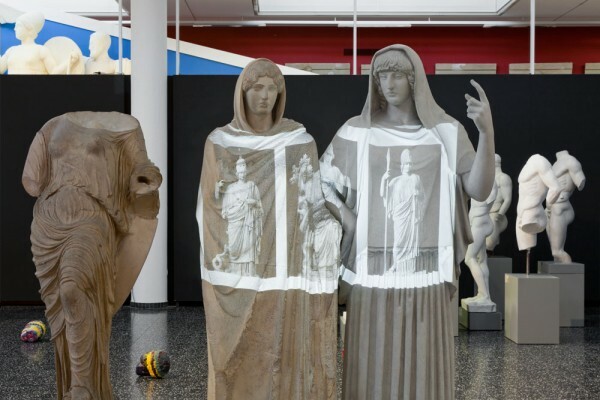 “Kopienkritik, German artist Oliver Laric’s summer solo project at the Skulpturhalle Basel, waxes upon the politics of the reproduction of images while drawing upon the Swiss museum’s collection of plaster cast copies of sculptures from classical antiquity. Laric collaborated with the museum’s staff to reinstall and arrange their collection of casts, interspersing his own sculptures and video works shown on monitors and projectors throughout the museum. That Kopienkritik largely comprises works of art not created by but rearranged by Laric calls into question the functionality of the artist as not a maker of things, but a producer of ideas. 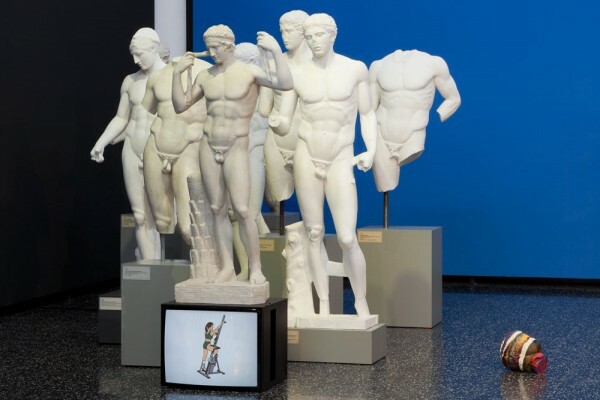 Kopienkritik (“copy criticism”) is the process of analyzing copies of classic sculptures —typically Roman reproductions of lost Greek versions — to arrive at a greater understanding of the originals. Within the art history community, the practice is seen as a last-ditch way to study ancient Greek sculpture — and one bearing many discontents. For example, ancient Greek sculptor Polykleitos, active in the 5th and early 4th century BCE, made major contributions to sculptural practice with his “invention” of contrapposto, but as his works are all lost they may only be studied and understood through lesser-quality Roman copies. To illustrate this principle, Laric grouped sculptures together similar in appearance and posture, creating visible aesthetic lineages between each work. 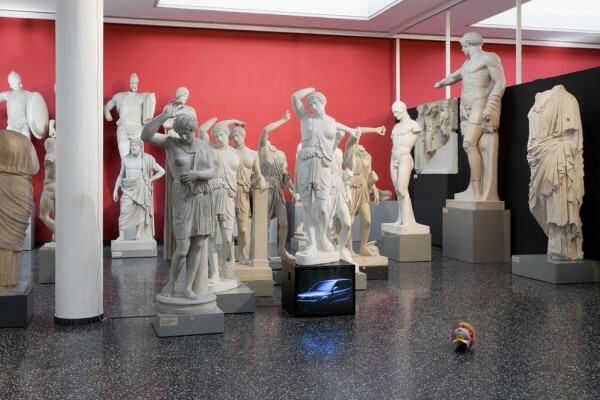 These groupings are put into a theoretical framework by Laric’s essay-video Versions, projected onto two similar plaster casts in the Skulpturhalle installation, the video attempting to fast forward discussions surrounding the authenticity and proliferation of images to an internet-sensitive context. Curiously, also on display in Basel is Mexico City-based artist Francis Alÿs’ collection of other artists’ portraits of the lesser-known saint Fabiola, the patron of nurses (having built the first hospitals in Rome) and of disenfranchised women and divorcees (having become an ascetic Mother Theresa-type after leaving an abusive marriage). Each piece in the massive collection centers around a now lost late 19th century painting by French artist Jean-Jacques Henner imagining Saint Fabiola as a beautiful young woman donning a red cape. The 300 copies, ranging from paintings to embroideries, function in a similar way to that of Laric’s ancient plaster copies: they all effectively inform a more skilled, academic original version which is now lost and exalted by society. Importantly, both collections are meant to be taken as a whole, or a sum greater than its parts, with little heed paid to the identities of the artists or autonomy of their constituent art works. Thus, the works included in the exhibition are pawns in a larger game, or words strewn together to create sentence nearly divorced from their original meaning. While there is some room for artistic freedom in the copies presented in Alÿs’ presentation—depictions of Fabiola range in age, hair color, and medium— there’s little artistic license found in Laric’s arrangements of plaster casts: the copy is supposed to appear as “true to form” as possible. Such a subtlety points to the variations in Laric and Alÿs’ impetus to produce artistic meaning through the rearranging of artworks. Alÿs illustrates the irony of collectively shared feelings of marginalization obsessively expressed through self-made kitsch. 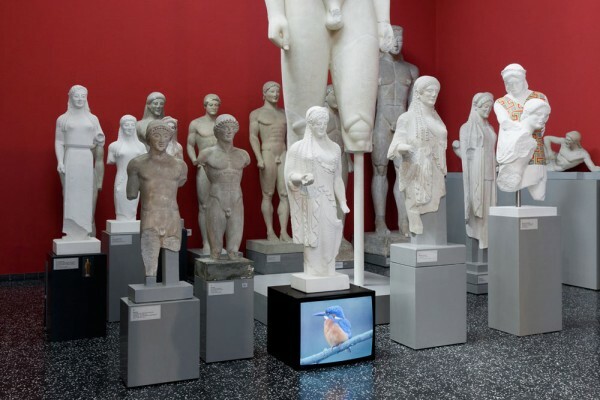 Laric highlights the still-pervasive authority of the “original,” underscoring the lack of innovation in each successive copy of the Greek sculpture while couching it in modern art historical rhetoric surrounding the study of classic sculpture. Also informing his collection is Laric’s long-held interest in the infrastructure of the internet. Perhaps in a contemporary setting, Laric’s assemblages could be seen as a form of crowd-sourcing information similar to infrastructure of many Web 2.0 platforms. Here, authority and informational integrity is rendered not by totemic truths, but by populism—like the function of Wikipedia, truth is conferred not by what a subject is, but what most people think it is. Beyond this, Laric signals that the politics of identifying where substance and truth lies in interacting with our increasingly complex world is age-old question with no plain answer.” – Karen Archey for Rhizome. The entry 'Oliver Laric and Raffael Dörig' was posted on December 21st, 2011 at 10:19 pm	and is filed under Uncategorized. You can follow any responses to this entry through the RSS 2.0 feed. Both comments and pings are currently closed.